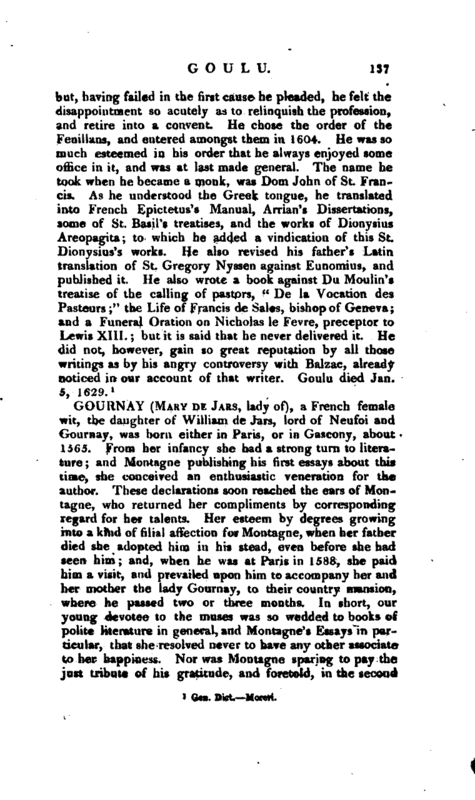 , a French female wit, the daughter of William de Jars, lord of Neufoi and Gournay, was born either in Paris, or in Gascony, about 1565. From her infancy she had a strong turn to literature; and Montagne publishing his first essays about this time, she conceived an enthusiastic veneration for the author. These declarations soon reached the ears of Montagne, who returned her compliments by corresponding regard for her talents. 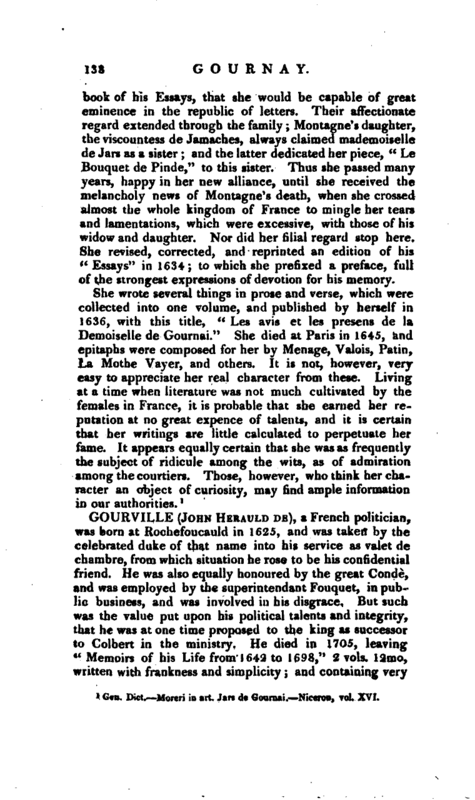 Her esteem by degrees growing into a kind of filial affection for Montagne, when her father died she adopted him in his stead, even before she had seen him; and, when he was at Paris in 1588, she paid him a visit, and prevailed upon him to accompany her and her mother the lady Gournay, to their country mansion, where he passed two or three months. In short, our young devotee to the muses was so wedded to books of polite literature in general, and Montague’s Essays in particular, that she resolved never to have any other associate to her happiness. Nor was Montagne sparing to pay the just tribute of his gratitude, and foretold, in the second | book of his Essays, that she would be capable of great eminence in the republic of letters. Their affectionate i-egard extended through the family; Montagne’s daughter, the viscountess de Jamaches, always claimed mademoiselle de Jars as a sister; and the latter dedicated her piece, “Le Bouquet de Pinde,” to this sister. Thus she passed many years, happy in her new alliance, until she received the melancholy news of Montagne’s death, whet) she crossed almost the whole kingdom of France to mingle her tears and lamentations, which were excessive, with those of his widow and daughter. Nor did her filial regard stop here. She revised, corrected, and reprinted an edition of his “Essays” in 1634; to which she prefixed a preface, full of the strongest expressions of devotion for his memory. 1 Gen. Dict. —Moreri in art. Jars de Gournai. —Niceron, vol. XVI.